Lisa Mason won gold in the vault at the English Championships in her first competition in more than 12 years. The 1998 Commonwealth champion, whose last competition was the Sydney 2000 Olympics, averaged 13.250 to win from Eleanor Thompson and Eleanor Clifford. The 31-year-old mother of one decided to return to the sport after a demonstration event at London 2012. "I mean business. I'm not doing it for a laugh," said Mason, whose focus now turns to the 2014 Commonwealth Games. 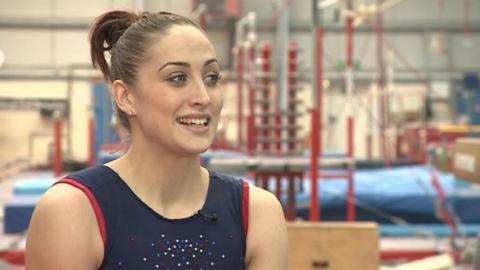 The Huntingdon-based gymnast had become inspired to train again after seeing the build up and excitement around London 2012. Her next event will be the British Championships at the end of the month, which will be the final opportunity for athletes to qualify for April's European Championships in Moscow. "I just came out here to have it as a trial competition for the British so I'm over the moon. Thirteen years out and to come away with a title already - I'm really really pleased," Mason told BBC Sport. "I'm doing it to enjoy it and I'm loving coming back but I just hope a lot of people are coming to the reality that I am actually coming here to do something like this." Double Olympic bronze medal winner Max Whitlock, 20, won the men's all-around title ahead of Reiss Beckford and Sam Oldham. Hannah Whelan, 22, a double bronze medallist in last year's European Championships, who also competed in the Beijing and London Olympics, won the women's all-around.